Northeast Indiana DiscoverE and its regional partners donate $1,250 academic awards given to engineering students during the yearly Engineers’ Week banquet held in February. 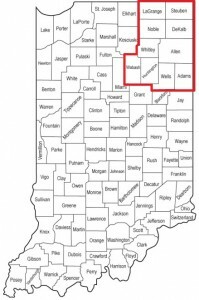 The candidate must have graduated from a high school located in the Indiana counties of Adams, Allen, DeKalb, Huntington, LaGrange, Noble, Steuben, Wabash, Wells, or Whitley; or live in one of the listed counties for a minimum of one year. The candidate must be enrolled in a curriculum leading to a Bachelor’s Degree in Engineering or Engineering Technology. The candidate must have earned a minimum of 30 semester credit hours (45 quarter credit hours) to a maximum of 96 semester credit hours (144 quarter credit hours) applicable toward an Engineering or an Engineering Technology degree by the start of the most recent fall term. The candidate must be a full time student carrying 12 or more semester credit hours. Applications must be signed by a faculty member where indicated on page 2 to be eligible for consideration (E-filed applicants must include a signed scanned copy or have their faculty advisor E-mail their recommendation to the application address). Northeast Indiana DiscoverE receives donations from organizations and companies in support of yearly Academic Awards that are given to engineering students in the Northeast Indiana area. These awards are given to recipients by donors during the annual Northeast Indiana DiscoverE Engineers Week banquet. through the mail to: Northeast Indiana DiscoverE, c/o Treasurer, 1802 Florida Drive, Fort Wayne, IN 46805. On the memo line please write “DiscoverE Donor Award”. A donation of ½ of an Academic Award donation contributes $500 toward the actual Academic Award; $60 toward the banquet meal of the award recipient/their guest; and $80 towards Northeast Indiana DiscoverE overhead and banquet costs. Please note, the cost for the award presenter’s banquet meal is not included and would have to be purchased separately. A full $1,250 Academic Award donation contributes $1000 toward the actual Academic Award; $90 toward the banquet meal of the award recipient/their guest plus the donor’s award presenter; and $160 towards Northeast Indiana DiscoverE overhead and banquet costs.